All that remains of Qui-Gon in the prequels is his echoing voice calling out to Anakin while he slaughters the Tusken Raiders in Attack of the Clones, and Yoda’s revelation to Obi-Wan in Revenge of the Sith that Qui-Gon has returned from “the netherworld of the Force”, and will teach them “the path to immortality”: how to maintain consciousness after joining the Force. How Anakin achieved this remains something of a mystery. The RotS screenplay provides a little more information: Qui-Gon learned about it because a “Shaman of the Whills” achieved it, and a Sith could never manage it because it requires compassion rather than greed. “No attachment, no thought of self, no physical self.” Some of this dialogue also made it into Matthew Stover’s novelization. We will return to the question of compassion and attachment in Part 2, but “Shaman of the Whills”? Worshippers of the Whills have made their way into canon through the Guardians Chirrut and Baze in Rogue One, as well as the Disciples mentioned in Greg Rucka’s Guardians of the Whills. While the Whills themselves have always been mysterious, in early drafts of A New Hope they were interchangeable with the Force itself, and Lucas has recently suggested they are godlike beings who “control the universe“, and that his sequel trilogy would finally have addressed them. That story will likely remain untold, but Lucas did return to explore Force ghosts further in what were (at the time) the final episodes of The Clone Wars. Part 2 of this article will address the “letting go”. For now, what exactly does “knowing your true self” mean? “Balance” has been a recurring idea since The Phantom Menace. In the prequels, the Jedi note with concern the growth of the dark side and the shrouding of the Force, and look for a prophesied “chosen one” to end what the Priestesses refer to as “The Great Imbalance”. 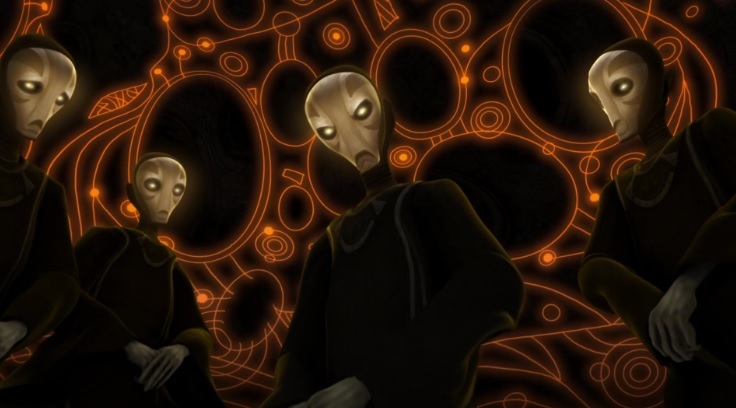 The Mortis arc in TCW explores this idea by personifying the light and dark as allegorical characters in a medieval morality play, as the ambition of the dark Son throws the Force out of balance. In The Last Jedi, Luke describes the Force as “the tension, the balance, that binds the universe together.” There are no definitive answers or interpretations (nor should there be, because that would spoil the fun), but if light and dark are both inevitable, “balance” seems to be another way of saying “the natural order of things”. But if the Force also lives inside us, so do light and dark. The mural in the Ahch-To Temple shows the first Jedi meditating not only on the light and dark in the galaxy, but also the light and dark within. 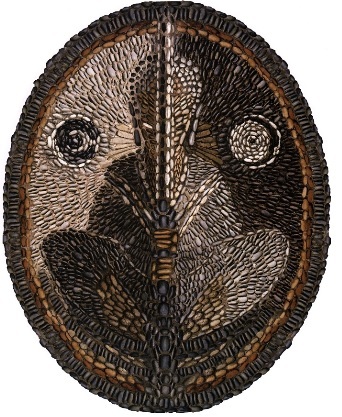 The Star Wars approach to this idea features elements of the work of the Swiss psychoanalyst Carl Jung, whose theories inspired Joseph Campbell, who applied Jungian ideas to worldwide myths and directly influenced Lucas. In Jung, part of the process of Individuation – your growth to your full potential, or “Self” – is to confront your Shadow. The Shadow represents all the things about ourselves that we repress because we don’t want to acknowledge them, and we tend to “project” it onto others – usually our enemies – because it is easier to hate these traits than confront them. The Shadow usually appears in dreams as the Enemy archetype, and Jung says we must confront our Shadow through psychoanalysis, and acknowledge it as part of ourselves – only then are we able to understand our nature and make ethical choices. This process of integrating the Shadow seems to be the heart of a Jedi’s journey, or at least those of Luke and Rey. Luke hates Darth Vader, the man who killed his father, and wants to destroy him. Vader is the stereotypical Enemy, a purely evil being upon whom Luke projects his own Shadow. Luke then learns that Vader is his father, his own flesh and blood, and more than that, Luke has the potential to follow the same path. This is first revealed to Luke in a dream sequence in an underground cave on Dagobah, symbolic of the repressed nature of the Shadow. Luke must reconcile this if he is to achieve his potential and avoid the path to the dark side. Rey’s journey to knighthood is incomplete, but she has already faced similar challenges. Her first encounter with Kylo Ren is as a shadowy, frightening figure in a dream sequence in The Force Awakens – the archetypal Enemy. In TLJ, she learns via their forced conversations that, though their circumstances were different, her feelings of parental abandonment, loneliness, and disillusionment with her mentor are shared by Kylo. Her fears that she must find her own way forward, without the guidance of a parent, are confirmed in her own underground cave sequence, and her temptation is to follow Kylo instead – to destroy the people and institutions that have failed them, and allow him to guide her destiny. She leaves the throne room with a greater understanding of herself and her Shadow, and with the strength and wisdom to find her own way forward, stand in defense of the light, fulfill her potential, and not let her identity to be defined by Kylo. It is only when the Shadow has been confronted that a Jedi can truly stand in defense of the light against the aggressive dark, and work to maintain the cosmic balance; just as Jung believed that only when individuals stop projecting their Shadows onto a foreign “other” can international peace and harmony be achieved. And mastering your dark side is not something you only have to do once to achieve “True Jedi” status. It is a lifelong, daily battle, as Luke’s instinctive moment of fear and weakness with the sleeping Ben Solo shows. This, too, is central to Jungian theory: the journey does not end at adolescence, and even in old age we are still working towards finding the Self. 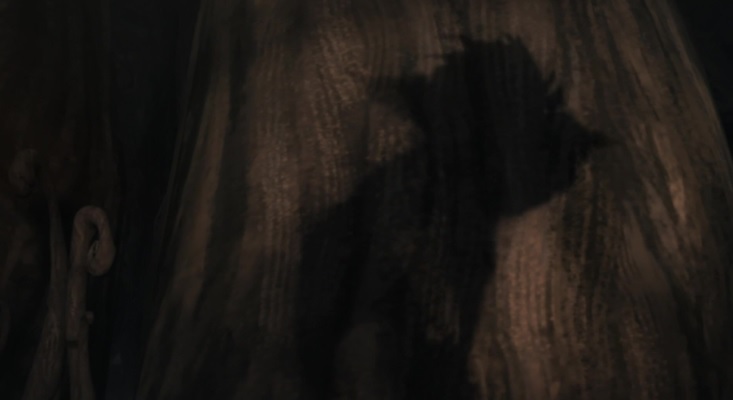 In “Destiny”, Yoda, at almost 900 years old, must enter a cave and face his Shadow once again, and there is no room for metaphor or allegory – he literally faces his Shadow. In overcoming this trial, Yoda reaches a greater understanding of the mistake the Jedi made in fighting the war, and how they have contributed to the rise of the dark side and the imbalance of the Force. The Yoda of The Empire Strikes Back who tells Luke “wars not make one great” is born here. “In our arrogance, join the conflict swiftly we did,” he tells Ezra Bridger in Rebels. “Fear, anger, hate – consumed by the dark side, the Jedi were. A challenge lifelong it is, not to bend fear into anger.” Mastering your dark side so that it does not master you, and finding this greater enlightenment, seems essential to the ability to become a Force ghost. When the Priestesses talk of finding “your true self”, the use of the word “self” echoes the “Self” (with a capital “S”) of Jungian psychology, the fullest and most complete version of yourself that you achieve after Individuation. This may help to explain how Anakin appears as his younger self as a ghost in the Special Edition of Return of the Jedi: this is his “true Self,” and it has taken him all these years to finally overcome his dark side and find it. Of course he would not appear as the being who was consumed by the dark side. 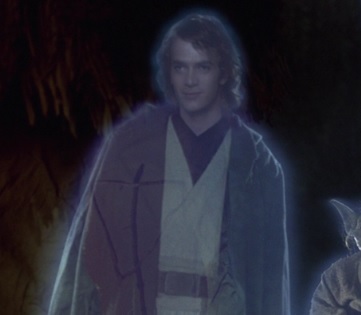 Another explanation is found in Claudia Gray’s short story “Master and Apprentice”: by ANH, Qui-Gon has learned to appear physically as a ghost, and the process involves “drawing upon his memories of himself and taking shape, reassembling the form he last had in life.” If Anakin prefers to think of himself as Hayden Christensen rather than the broken body of Darth Vader, who are we to judge? In TLJ, when Luke Force-projects himself to Crait, he chooses a younger form . Though not technically a Force ghost, perhaps similar rules are at play. So much for “finding your true Self” – what of the “letting go” part? This is where the Force ghost idea takes us to the heart of the difference between light and dark, and the key to unlocking the nature of the Force – perhaps the whole of Star Wars. And this will be the focus of Part 2 in two days. This is a nice article. Jung’s idea of projecting one’s repressed character traits onto the enemy makes an interesting framework to analyze Star Wars stories. However, I have a couple of questions about how to apply Jung’s notion in TLJ. 1. What’s the negative character trait of Luke that he had repressed and then projected onto Ben, such that it made Luke briefly considered killing his nephew? 2. Can the repressed-and-projected traits be positive? Otherwise, it’s difficult to explain why Rey would be tempted to join Kylo after the throne-room battle, when he had made it clear that he’s not calling off the attacks and intended to destroy her new-found friends in the Resistance (Finn, Leia, Poe, etc.). Thank you! Those are some really good questions. 2. The repressed traits can be positive in the sense that we become a better person when we understand them, yes. With Rey, she has repressed the truth about her parentage – she fears not having a place in the world and looks desperately for parent figures. So the truth given to her by the cave and by Kylo is something she needed to hear, and Kylo is an interesting Shadow because he *did* have all the things Rey wants, but still felt lost and rejected. Her temptation is to give in to those emotions and look to Kylo to guide her, rather than rise above them and master her shadow.